The last time I came back from a break, this blog finished first among all Braves blogs in August. Lets see what kind of magic we can come up with this time. Because of Hewlett Packer. Those expletives took forever to give me my laptop back! The Braves are eliminated from the playoffs, and they sure are playing like it. Having dropped three in a row, two to the Nationals no less, that spark in the team certainly has left. I’m a bit tardy on covering their near-historic streak, but I will say that pitching and timely hitting carried them. His performance: Derek was brought in to lead the staff, and a 4.55 ERA doesn’t really say, “leader”. Sadly, he does lead the team in wins, but thats a totally different story. His age: The man is 36 years old. While thats young in our world, he’s old in baseball years. Much like dog years, you have to convert it. 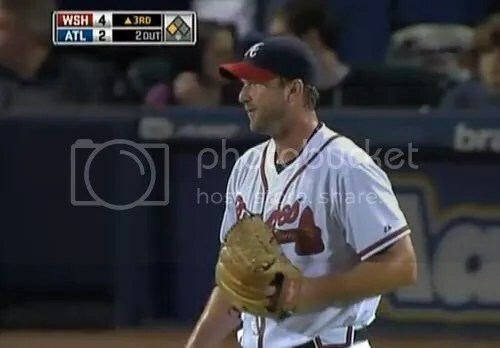 So Derek Lowe is actually 72 years old, until he retires. 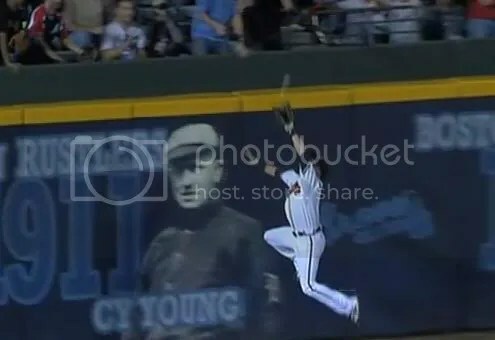 Nate McLouth deserves some serious props for this incredible play. Also, I will be covering select playoff games, so, there is something to look forward to do.